We've talked for some time about using low-melting point alloys like Wood's metal (65oC) and Field's metal (40oC) in a RepRap write head to allow us to build electrical circuitry, and such a system is being planned for RepRap 2.0 "Mendel". We have also talked of trying them in exactly the same extrude head that we use for polymers, for which we'd need them in the form of a 3mm rod. I've always thought that the problem with this might be that the (admittedly small) melt cavity inside the head would simply drain out the bottom uncontrollably. But the other day my student who's working on this, Mike Samuel, had a brilliant idea: why not replace the cavity with a small heated button with a fine extrusion hole through it, then just touch the metal on the back when you want it to melt and extrude? The extrusion system already has a mechanism to back the rod off; this would remove it from the hot-spot and stop the flow. The head would be like the above. 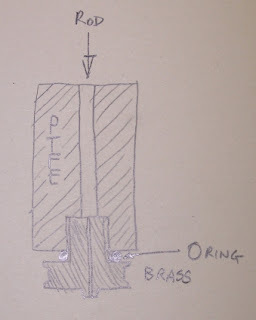 The brass part would have a heating coil, like the ordinary extruder, and a thermistor to measure its temperature. The Wood's metal rod would be fed into the top by the existing transport mechanism that's used for the 3 mm polymer rod we use. And all this would use exactly the same electronics and software to drive it that we already have. So I tried to make some 3 mm Wood's metal rod. My first experiment was rubbish: I had a small crucible with a 3mm hole in the bottom heated by a soldering iron. The hole led through an insulating block with a 3 mm hole to a cooled section with another 3mm hole, where I thought the metal would solidify and be able to be pulled through - pulltrusion, as it's called. The whole thing locked up frozen solid, and nothing would move anywhere. very nice! now we have an easy way to make woods metal in the required diameters. where do you get yours? is this something one could buy over the internet? I've seen it lots cheaper than this on eBay. Very nice. I was playing with Wood's Metal recently as well. I used a small slow-cooker (crock pot) to melt the metal. Works extremely well. I was able to use a small syringe to draw off some of the molten metal. Nice way to make metal slugs (10x40mm cylinders) for easier melting. 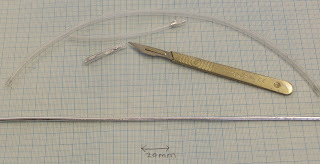 I just now tried running some through some plastic icemaker tubing (1/4"OD). The rod came out to about 4mm diameter. If we mould it between bits of toothed belt or somesuch, we can improve the accuracy of feeding. It's a very clever solution! Is is possible to re-use the tubing? Maybe by slipping it into a larger piece of tubing? Cross-section might look like a C inside a larger backwards C, for instance. Cover an threaded rod with Polymorph or another plastic, like PLA. then get out the rod, put the euthetic alloy on it, and, cut out the plastic cover and recycle it? hmm... that is clever. BTW has anyone here ever used an induction heater, this would be a great way to keep a length of LMP alloy molten during dispensing, and "pulse" the IH power or via two electrodes to make it dispense via surface tension, like a print head does with ink..
i saw that happen on a solder gun once.